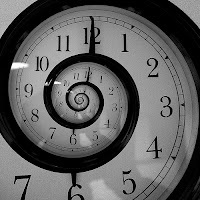 We often lament on the paradox of time. It doesn't stop. Time flies we all exclaim, and then there are umpteen things to be done. There are unending tasks that want us to pause for. Wish we could have the incredible, quixotic time machine to go back into past .....into the bright spot of ones life. The innocent childhood. Scenes of past that decor my memory lane blossom with full spring ever. A joint family it was till I attained teenage. The beauty is in love and pampering by grand parents. Though I stole "green mangoes " from granny's pickle jar her reactions turned me into responsible person. Though I hid his "chappals" [flip-flops for you] my grandpa always laughed at it. He was like a spur of catalysts constantly encouraged me in my every activity be it academics, table tennis, shuttle badminton. Took me to movies. A constant inspiration as he was, his face as I saw on my wedding day is one of the flashes I remember as he is no more with us today. It revealed so many unsaid advice for me when he was gone today............One joke of his, I can remember, to crack me up as a child was "What is the opposite of O.K?". On my sad negative nod he would say.it's NO.K!!". I wish I could go back into past to give them an extra bear hug and feel the special moments again. Being with "chachu" [chachu in Hindi is paternal uncle who is fathers brother] was like having a friend at home. I hid his scret of "smoking" from my granny for which he bribed me with rounds on his new bike and some movies! My chachu was my another mentor and constant support. At age 6 each time as jealousy creeped upon me over my little sister my chachu kept me busy and played with me. Need to mention he was the huge support of pillar who initiated positively when I decided to marry out of community one day! I wish I could go back into past to feel the special moments again.. The two gems of my life my sisters. Their constant expecting faces is still fresh in mind as they treated me like "big didi"[elder sis]. Times of quarrels are numerous. The younger one is still a baby to me who was fed, given bathe by me. At mere 13 age I dressed her to school as she went to kindergarten. I was like amma's [Amma in south Indian language means mother] right hand in her care taking. Only few days back did I remember how I managed to push my sister over the big stumbling step between the rooms of our old ancestral house and her chin had bled. 3 stitches on her chin was the solution for my reckless act! Yet the bonding love is eternal. I wish I could go back into past to give them a bear hug again...feel the special moments again. And then comes the tremendous peerless love of mom and dad. There is story in mythology which I mention here in brief. When Lord Shiva faced a challenge by Lord Narada, he had to throw a challenge among his two sons Lord Ganesha and Lord Subramanya as to who will go round the world first on their vehicles, mouse and peacock respectively. Now with the mouse needless to say, so Lord Ganesha used his wit and went round his parents on his mouse which was not only faster but also impressed everyone with the moral that parents are equal to god for us. Clock ticks not to stop, times lapses. Let's leave the tomorrow, it is unknown. Lets' live the today, It is a fact. Beautiful story indeed. Your heart is also full of so much love. Thanks you for sharing. Seriously well written. Touching story. I am one hell of a nostalgia freak! I can identify with your story so much. Good one Sushma. Aditya- Am so very glad you liked my writings and also that we have common likes about the nostalgic views and you could relate to it. "green mangoes " they are irreplaceable, I still remember a couple of weeks back, Me and my friends jumped the walls of a house near our college and stole a whole lot of mangoes in our college bags! HE is in for surprise when he looks up that tre, That owner! Thank You as you liked them all. Your post brings back nostalgia and memories of happy childhood days. Like you mentioned, I too wish I could go back into past and soak my mind in the special moments again. The story in mythology is one that I love because it is so meaningful and teaches a valuable lesson about how sacred and beautiful parent-child relationship is. You are right. Iam happy you could relate to my thoughts. postinagn yang bagus tentang"Rewinding Wishes on Family Love"